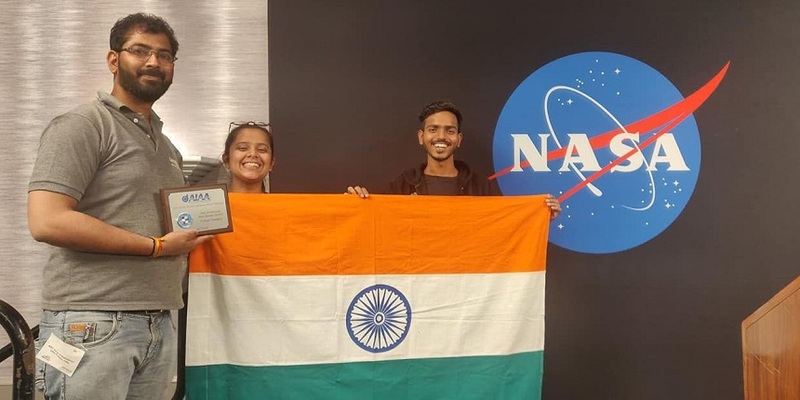 NEW DELHI, APRIL 16: The team from KIET Group of Institutions, a pioneer in engineering since 2 decades has won the 2019 AIAA Neil Armstrong Best Design Award in the 25th Annual Rover Challenge held at the US Space and Rocket Center in Alabama. The award is given to the best designs that meet the Rover Challenge performance requirements. “It is a great honor for us and showcases our dedication to innovative engineering. Our students have been working hard for the past six months and their commitment has paid off. The best part is that this is the first time we have participated in the competition and were pitted against teams who had been competing for the past 20 years.” said Tuhin Srivastava, team advisor from the college faculty, who was also present with the team to receive the award. KIET Group of Institution’s four-member team, led by Shatakshi Dwivedi, a mechanical engineering student was competing among 115 teams from all over the world in presenting the best design for a Mars Rover. Indian-American NASA astronaut and two-time space flight veteran Sunita Williams attended the second day of the event, interacting with teams and participating in the day’s activities. Dwivedi (22), who is visiting the Space Institute for the first time, said, “It was challenging to be a captain but the team was very supportive. Since it was our first time, it involved risk factors. A lot has been learnt from the participating teams and I feel plenty of technology can be brought back to India.” Her team associates Abhimanyu Bhagat, Utkarsh Sharma and Suyash Yadav felt overwhelmed as their project “MOON BUGGY” demonstrated excellence amongst participating competitors, hailing from a record number of countries including Germany, the US, Bolivia, Peru and Egypt. Each year the NASA Human Exploration Rover Challenge features an engineering design challenge to engage students worldwide in the next phase of human space exploration. The annual event is a complex follow-up to the successful NASA’s Great Moonbuggy Race; and, challenges high school and college students to create a vehicle designed to traverse the simulated surface of another world. Every team had a six-minute window to navigate the course, gathering points and trying to complete 14 obstacles. After constructing their own rovers, teams attempt to transverse a nearly three-quarter-mile course with gruelling obstacles that simulate the terrain found on Mars, as well as other planets through-out the solar system.